The bloody explosive action kicks off and kicks one in the stomach right from the get-go. I wonder if this is a typical Seumas Gallacher opener – having read the Violin Man’s Legacy a little over a year ago. The opening scene in that earlier book is a real stomach-churner. 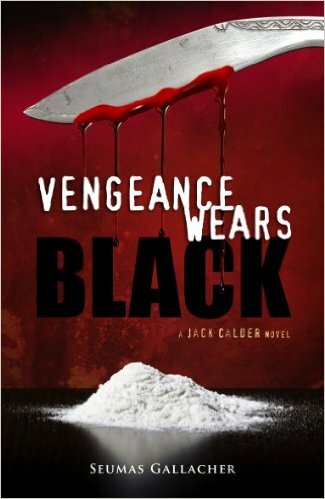 Vengeance Wears Black starts with a tense human trafficking operation in Krakow that goes horribly wrong. It then leaps across to London where another eruptive incident brings our main players together. This time a Gurkha colleague smothers a grenade with his body thus saving his friends from ISP – a band of tough action-hardened SAS men and one woman; who then carry out a carefully planned, meticulous operation that not only quells the violent turf wars raging between Asian triad gangs and Eastern European mobsters, but also avenges the death of the man who saved their lives. Seumas Gallacher’s book takes the reader on a nail-biting ride from east to west, from unimaginable debauchery and corruption to uplifting moments of friendship and care. I, for one, was glad of these little hiatuses in the action as they allowed me to get to know the main players, become involved in their fates, and follow the detailed planning that goes into such a far reaching operation. This isn’t a genre I usually read, so I was surprised by how much I was drawn into it. I had read the earlier book so I knew the background of the characters but, being a stand-alone novel, it is not necessary to read it to follow the action or the connections. These books would make a superb movie or TV series and I’m sure one of these days someone is going to discover them. Then we’ll see Mr. Gallacher’s name in lights, with our hero Jack Calder blazoned across the posters a la Jason Bourne/Matt Damon.